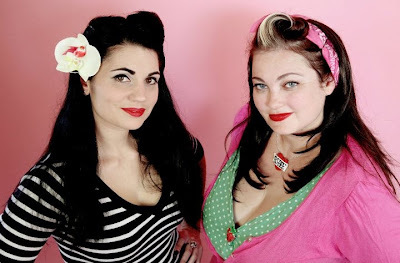 Its our weekly catch up with my partner in glamour crime Lilly Von Pink from the Vintage Pamperbox. This week its all about the fringe.Take it away Lilly. I do love this look with the hair rat but I wanted something quicker and due to having some hair damage from having a white streak in the front some of the hair in my fringe is very short due to breakage. Yes i know what your thinking its not very 1950's with the side bits but what I liked was the fitting. it cost me £6.99 which isn't bad. Its synthetic hair but its really good quality. To get it into the blunt slightly curved shape I was after I was brave enough to cut it myself. Its worth remembering that you can always take your clip in fringes into the hairdressers and ask them to shape them for you. Once the fringe was the shape I wanted I was ready to fit it. I start by taking the front section where my fringe should be and combing it over to one side securing with two crossed over bobby pins or kirby grips. I also clip the rest of my hair back out the way like so. Then when attaching the fringe I clip down the top fastener so the fringe sits in the centre. When I'm happy its in the right position I clip the two bottom anchor fasteners in place. 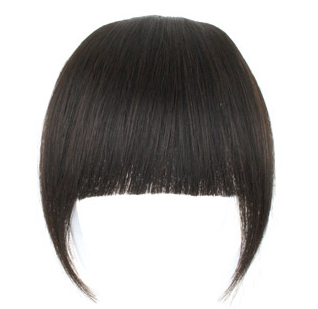 With this fringe you cant see the join so you can just unclip you hair or tie in a ponytail whatever you fancy. I like to wear one of my head scarfs. This is my favourite Vivienne Westwood one.